Transperth was the first company to introduce Perth people to the concept of tap-and-go with the SmartRiders. Now, that technology is available in most debit and credit cards. Withdrawals from this account from any ATM over $200, ING will credit you $0.50. Free ATM withdrawals - When you get charged an ATM fee (around $2.50) you will get it credited back to your account if you deposited $1000 or more to your account last month. By now you will also know that paypass is used everywhere, some of which are called paypass, others called paywave. Paypass locations can be found here. 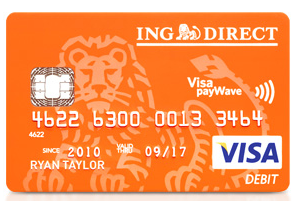 If you got the ING Orange card, let us know your favourite stores that have Paywave/Paypass in the comments below, especially those little Perth favourites. Also, once you open an Orange Everyday account, you can also activate a Savings Maximiser account with little fuss. This gives you 3.0% interest which, if you are saving for a home loan, can give you much more than you're probably getting with other banks. If you are saving $150,000, 3% is equal to $4,500 every year! They had this years ago - 7+ years ago. The old swipe you card at the pump. I believe they scrapped it after a few years as they realised they were losing sales inside as people did not walk in the store.